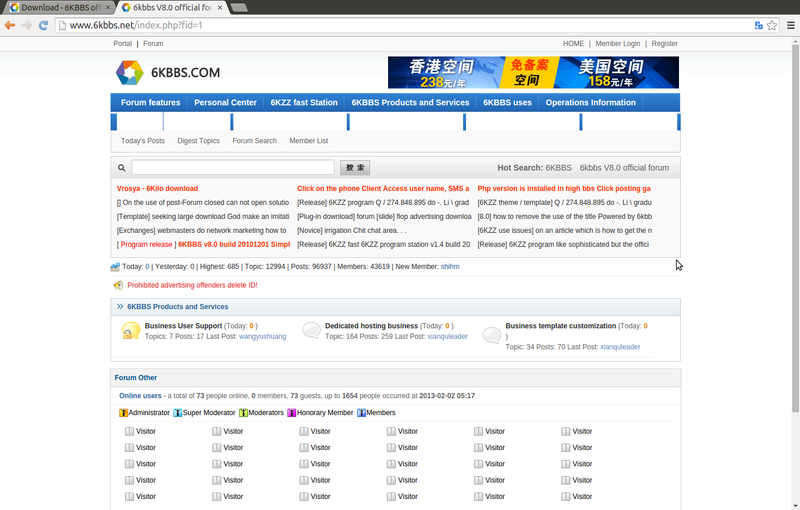 “6kbbs V8.0 is a PHP + MySQL built using high-performance forum, has the code simple, easy to use, powerful, fast and so on. It is an excellent community forum program. The program is simple but not simple; fast, small; Interface generous and good scalability; functional and practical pursuing superior performance, good interface, the user’s preferred utility functions." “1, using XHTML + CSS architecture, so that the structure of the page, saving transmission static page code, but also easy to modify the interface, more in line with WEB standards; 2, the Forum adopted Cookies, Session, Application and other technical data cache on the forum, reducing access to the database to improve the performance of the Forum. Can carry more users simultaneously access; 3, the data points table function, reduce the burden on the amount of data when accessing the database; 4, support for multi-skin style switching function; 5, the use of RSS technology to support subscriptions forum posts, recent posts, user’s posts; 6, the display frame mode + tablet mode, the user can choose according to their own preferences to; 7. forum page optimization keyword search, so the forum more easily indexed by search engines; 8, extension, for our friends to provide a forum for a broad expansion of space services; 9, webmasters can add different top and bottom of the ad, depending on the layout; 10, post using HTML + UBB way the two editors, mutual conversion, compatible with each other; …"
(2.1) The first code programming flaw occurs at “/portalchannel_ajax.php?" page with “&id" and &code" parameters in HTTP $POST. (2.2) The second code programming flaw occurs at “/admin.php?" page with “&fileids" parameter in HTTP $POST.